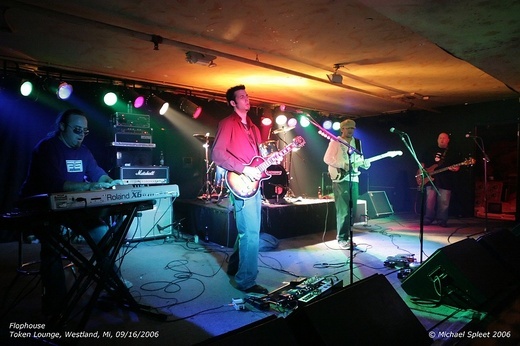 Although physically rooted in Detroit, Flophouse's soulful mix of rock, funk, blues and R&B evokes the great music traditions of Memphis, New Orleans and Chicago. 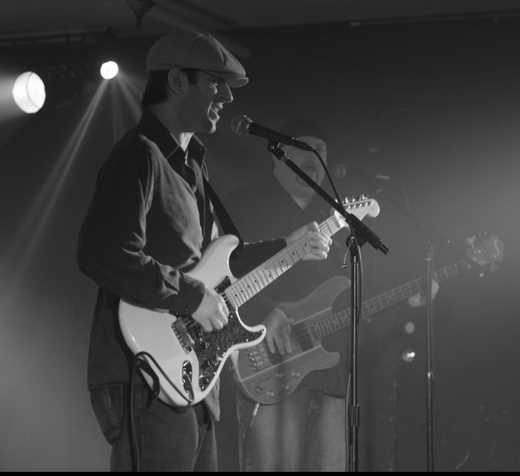 Perhaps it's Flophouse's lead singer Victor Colon, who's smoky yet spirited voice, draws frequent comparisons to the legendary Stevie Ray Vaughan. Or drummer Brian “Super B” Smith's and bassist Paul “P-dog” Hunt's unadulterated commitment to “funky groove rock” that has more bodies swaying then Bourbon Street during Mardi Gras. Finally, there's the polished riffage of guitarist Mike “Hollywood” Adkins -who masterfully weaves it all together into a spicy, sonic stew. Flophouse's extraordinary sound has not gone unnoticed. 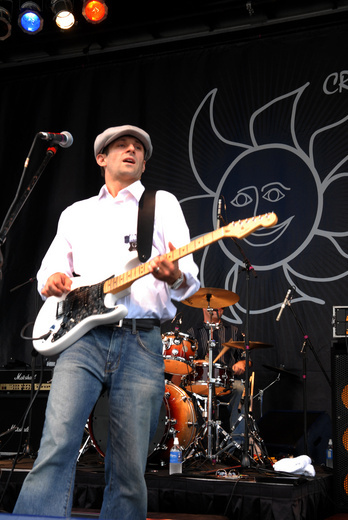 Hand picked from thousands of entries, Flophouse was chosen to perform at Eric Clapton's Crossroads Festival in Chicago in 2007. Clapton's acclaimed event received massive media coverage in Rolling Stone, VH1, PBS and more. 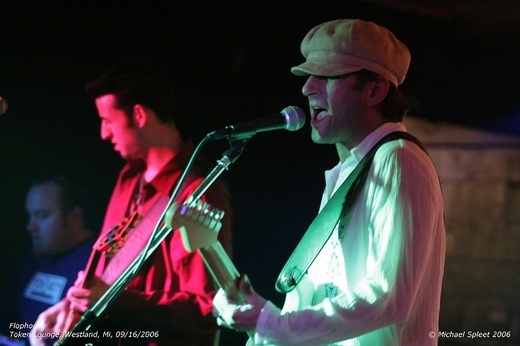 Locally, the band regularly appears at “A List” venues including Robustos Lounge, the Hard Rock Café and the Magic Bag Theatre, in between gracing festival stages across the country. 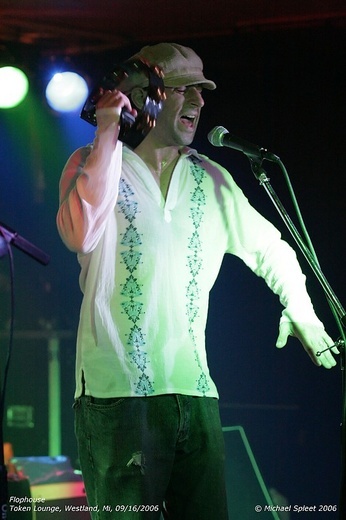 “We play every show as if we are playing a sold out concert at Madison Square Garden …even if it's at Jimmy's Sports Bar and Fish Fry,” explains Super B. And that they do; Flophouse's music moves you from the inside out. 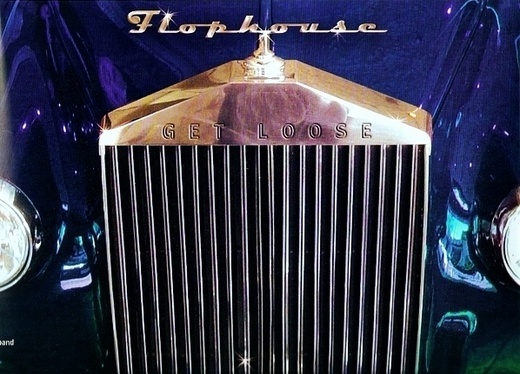 Currently, in the studio recording their first full length CD, you can get your own taste of Flophouse with their party-inducing EP “Get Loose” (Boiler Room Records), available NOW on CDbaby.com and iTunes! 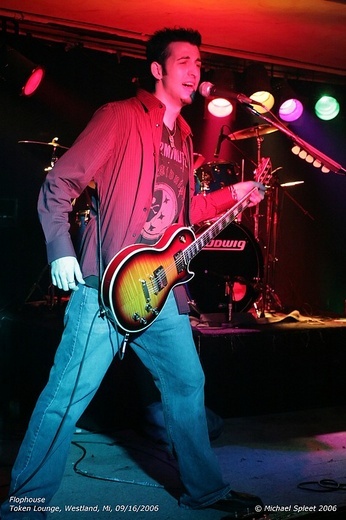 Reached 39th in Best of Rock chart in 2011. In the top 100 for 5 weeks. Finally. Tail Gators and the real reason for my nights adventure. The band I came to see, Flophouse, was not up yet. There was another band getting ready to go on in a few. I grabbed a bier and tapped the drummer from Flophouse on the shoulder. Brian "Super-B" is a real good guy. I actually think he was glad to see me. In a room full of people that are there to see his band, I'm the one that he stands up with and talks to for a good portion of time. I feel privileged! We bought each other a few biers and life is good. Brian is also the drummer in another area band called Viet Nam Prom. He works in the music industry on the retail side. I've been to his store and he is very proficient and knowledgeable. He is also the same with his drumming. Both of his bands that I'm aware of are very lucky to have somebody like him amongst them. 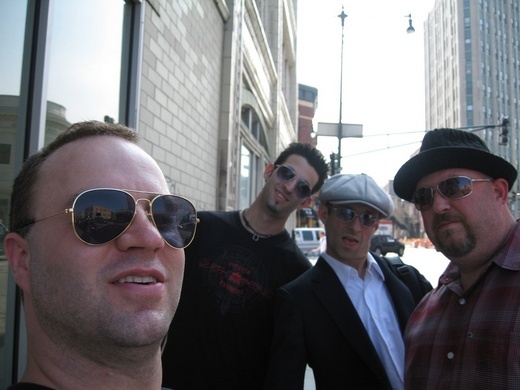 The first band, Misbehavin' (?) are good and tight. I like their set and they don't drop the ball anywhere in their music. They just seem to be a little to chorusy for me. I'm not sure I'd drive 40 miles to see them unless they were real good friends. If they are in the area, check them out. I believe that most real rockers will appreciate their brand of music which to me was in the vain of a poppy Iron Maiden. The singer has a good set of pipes and the duel guitars work well with each other but there was no real flash. They could have done it with a single strummer. Flophouse! From what Brian was telling me they have a new special guest member that is there this night. Peter Keys. He's a keyboard player. I bet you never would have guessed. 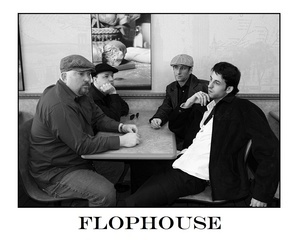 I'd heard Flophouse on their MySpace and I liked their tone. As with any good funk band they bleed rhythm and if you don't know the blues, just go home. As they took the stage, Tail Gators was standing room only. I'd seen Brian and his bandmates shaking hands all over the place and I could tell this was their crowd. I've never seen a funk band before that I recall. I know I've never gone out of my was to see one. I'm glad I did this night. Brian's snappy drumming and the two guitar funkification was good but what really did it for me was the keyboards. I had never seen anything like that before in any fashion. I just didn't know that there were people out there that could play that many cool notes on the keyboard. I know they just had to exists. I guess I just didn't know where to look let alone know that I was supposed to be looking for them. Well I had found it! This was great music. Not boastful. Not menacing. Not overbearing. Just real good raw jamming. I hadn't had so much fun watching a band since the last time I saw the Allman Brothers last summer. I'm not a music critic or writer of any great talent so anything I say about Flophouse probably won't do them as much justice as they deserve. The great tone that I heard on the recorded songs carried over to the stage. They have an extremely solid meter. Their songs are catchy as a funk tune should be. I was not the only one to be diggen on these groovy tunes. They were in the house and it was theirs. They did a good mix of original and cover tunes. I actually like the originals better. Their encore was a Steve Wonder tune that I'd heard before but I couldn't recall the title. The only thing that I could say negative about the set was that they could have taken a short break then came back and did another set. It was over way to quick and I couldn't relax and drink as comfortably as I would have liked to have. I was a long way from home in unfamiliar territory. I'm glad that I went out to check these guys out. They had almost the perfect set. I will go see them again and for all those versatile music lovers I will recommend them to be accelerated up to the top of everybody's "Must See" list. Peace! Today's pick is one of my new personal favorites. 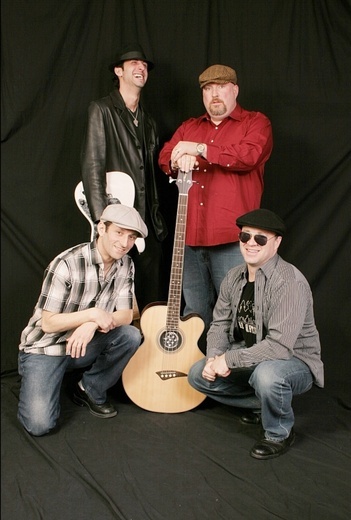 Their creative blend of rock, funk and blues is sure to put a smile on everyones face. Distinct vocals backed up by the wide range of everyone in the band gives Flophouse a unique sound that anyone can appreciate. 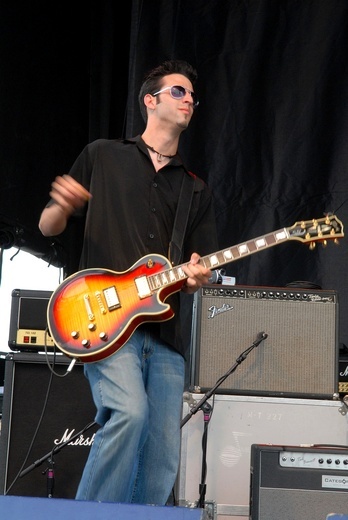 Their smooth, funky style is guaranteed to make the crowd move anywhere they play. 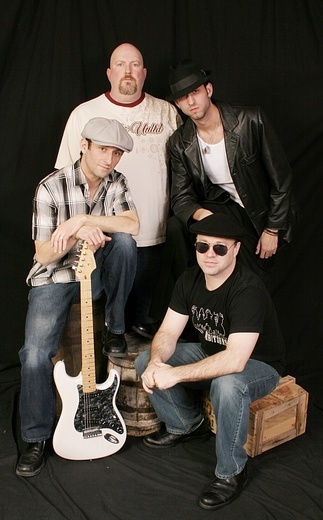 Review of Hard Rock Cafe Show: When you guys say 'Funk By The Pound', you really mean it. I saw you guys at The Hard Rock Cafe and I'm glad I made it out to the show. You have a great sound and the band seems to really work well together. I heard some great music with some well done cover songs. Keep up the good work! I'll try to come out and see you guys again soon, and I'd recommend everyone else keep an eye out for you. 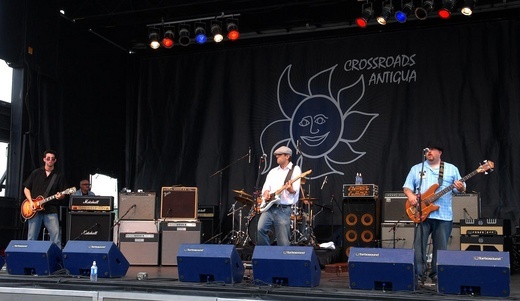 FLOPHOUSE has just been added on to... Eric Clapton's Crossroads Festival @ Toyota Park in Chicago, IL on Saturday, July 28th!!! Flophouse will share the stage with: Eric Clapton, Jeff Beck, Doyle Bramhall II, Robert Cray, Sheryl Crow, Vince Gill, Buddy Guy, BB King, Alison Krauss and UnionStation, Sonny Landreth, Albert Lee, Los Lobos, John Mayer, John McLaughlin, Willie Nelson, Robert Randolph, Hubert Sumlin, Derek Trucks, Jimmie Vaughan, Steve Winwood. 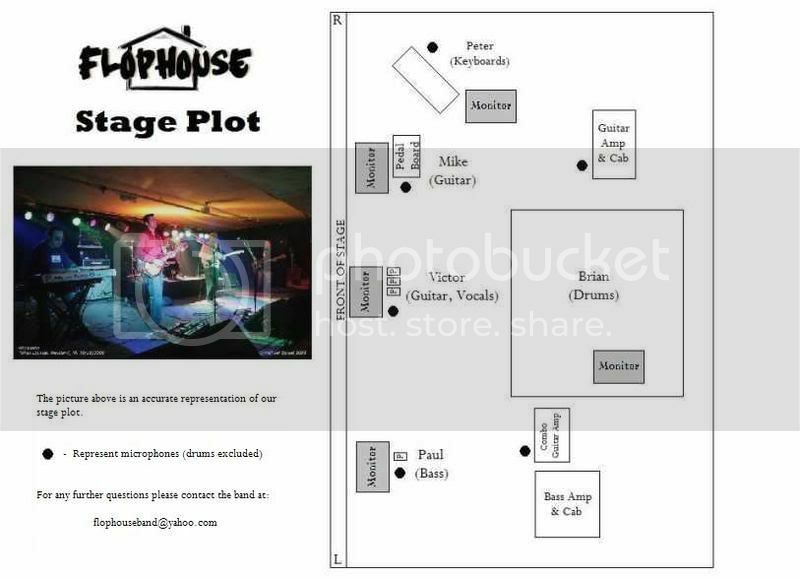 This is the real deal ....Flophouse has been handselected as the winner of Ernie Ball's Battle of the Bands contest. Flophouse opens the entire show!! If anyone is interested in attending the Crossroads Festival in Chicago, I know that it is "Sold out" but there are still a TON of tickets circulating on eBay for almost face value ($100). We'd love to see you all there! !